Like the previous commenter, I also add lemon juice (as well as white wine). It really is an incredible flavor enhancer. 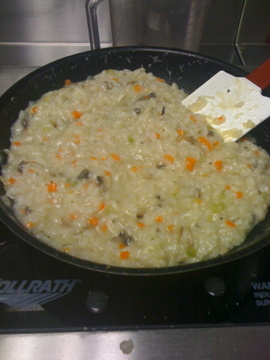 And, funny, I just made risotto tonight! (Will blog about it soon.) Thanks so much for the great comment left on my blog. I appreciate it, and have signed up for e-mail updates for yours, as well as followed you on Twitter. Thanks for commenting! You're so sweet! I stinkin' love the internets. Like you, I often (well, usually) prefer the written persona to in-person conversation. I'm kinda dorky in the real world. I'll share my xtra-super-secret risotto tip: Between steps 2 & 3 add 1/4 cup fresh lemon juice mixed with 1/4 cup seltzer- omitting the white wine. It deglazes the rice and the acids help to weaken the cell walls, releasing more starchy goodness. Awesome, thanks! I'll try your version, too, sometime and compare.